Summary: One of the foundational texts on games, it is an academic look at culture and play. A must read for game designers, and highly recommended for everyone else for serious consideration, but this is a dense text not written for a general audience. I struggle to write a review of a book that is probably one of the most cited books in game design texts. I can’t remember the last time I read something deeply about design that did not reference Huizinga. All the previous books I’ve reviewed have quoted him, and for good reason: this is the best book I’ve ever read about the field of play. That’s not faint praise. I read a ton, and Homo Ludens completely enthralled me. I recommend it to anyone searching for a deeper understanding of play in human culture. I wish I had not waited so long to finally sit down and read it. Written in 1938, you would expect it to be outdated but I felt the opposite: it’s incredibly relevant. 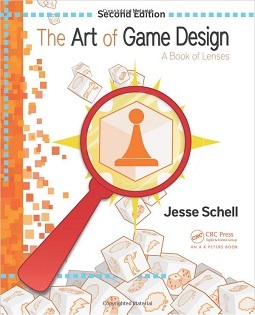 It is not your standard game design textbook: it’s short, at only 214 pages, with no lessons or rules on how to make games or even what makes a good game. It is an anthropology book, not a game design book. Despite its academic roots I actually found it fairly easy to follow without much background (he references other texts, but his arguments are pretty clearly laid out in his own words) but keep in mind that I tend to prefer more academic styles of writing so others may find it a difficult, dense read. Huizinga was a Dutch anthropologist, so I read an English translation of the book – I felt it was fine, but you get a bit of that stilted effect any time its not the native language. He also explores, defines, and uses some foreign words like agon, the Greek term for “play element”, and several terms related to competition and contest. These factors combine to create a very dense, theoretical, and difficult text to read. If that doesn’t bother you (it certainly doesn’t bother me) then please pick it up. The phrase “Homo Ludens” is the author’s proposed replacement for “Homo Sapiens”, instead of man that thinks he offers man that plays as a better description of our species. To support that, he takes a philosophical, historical, anthropological, and linguistic approach to “what is play?” and “what role does play have in human culture?” His main argument is that play is intrinsic to mankind, that it serves a valuable place because play is valuable in itself rather than as practice for some kind of survival instinct (as others claim). He claims that culture is derived from play, and that without play there is no culture. To back up his argument, he outlines the anthropological beginnings of many aspects of modern civilization that we associate with culture: war, law, religion, the arts, poetry, philosophy, and so on. In each of these chapters (titled clearly as “Play and War” and “Play and Law” and so on) he builds out the origins of that element by looking at “primitive” people (an unfortunate term, but don’t let that distract you) that exist outside of modern civilization (which he does not quite define) both from the past and his modern day. He claims each of these – from religion to law – are rooted in play, and as our civilization(s) progressed the play-element became less important and more obscured but, nonetheless, still exists. By looking at those cultures that haven’t progressed into modern (mostly Western) civilization, he can point out more obvious influence of play in things like law and religious practices. He draws from a wealth of human culture that spans the globe: from Inuits, to early Chinese societies, to the origin of Greek contests, to Norse mythology, to tribal African religions, and so on. It’s hard to really sum up his findings because it’s so dense with ideas. For example, he points out that philosophy originates from riddle-contests, where knowledge was not only sacred but also a tool to beat others (outsmart them) in a contest. He points to the anthropological underpinings of law as not a quest for truth but rather a method to settle disputes while entertaining an audience. Early justice in many societies took the form of rhetorical battles, insults, poems and dancing performances – all contests, and often entertainment, with very little focus on moral judgment (this comes later). I think Huizinga makes a very good case for religion and ritual as rooted in play, but this is the hardest to summarize from the book while doing it justice. Huizinga is the person who coined the term “magic circle” as the special place where the rules of the real world give way to the rules of the game or play. While as modern game designers we think of the magic circle as, say, the poker table, the chess board, the tennis court, or the game world in a video game, Huizinga applies that term more broadly. For him, the magic circle is a ritualistic space: it is the playground, the courthouse, the temple, and the battlefield. 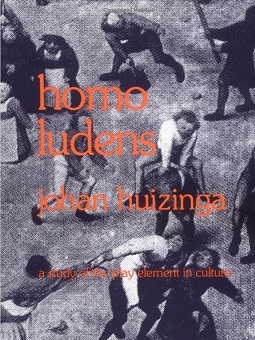 To give you an idea of the exhaustiveness of his argument, Huizinga places the following under the domain of play: contest, competition, wagers and gambling, performance, warplay, wordplay and rhetoric, riddles, divination, art, holiday feasts, gift-giving, harvest celebrations, ritual and religion, honor and chivalry. One of my favorite pieces in the book was his description of potlach, a form of one-upmanship in gift-giving and conspicuous consumption (and destruction) of wealth. I learned a lot from this book that, I think, will continue to inform me as a designer. I found myself thinking a lot about how I could integrate ritual and performance into games, but also drawing connections to many things we do in life that could be considered forms of play – poetry slams, celebrity worship, Passover seders, and the talking heads arguing on Fox News. Like I said, this is not a practical book nor is it an easy read, but if you make games for a living it is worth your time to read this and reflect on how your games fit within this space of play as Huizinga describes it. All professional designers should give this book a try, especially those interested in art games and experimental forms of play. 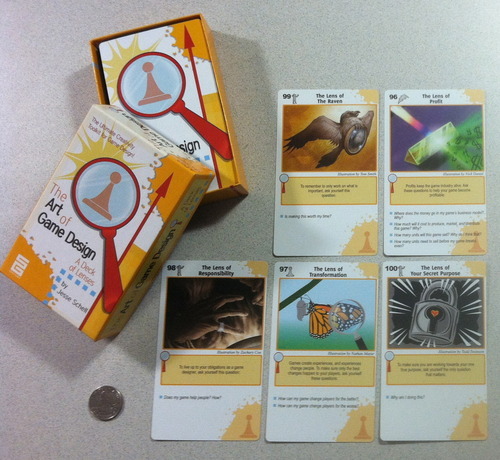 Students just getting into games may not see its relevance immediately, and might be better served by a different text (like Art of Game Design). But regardless of where you are in relation to game design, if the above article piques your interest then I sincerely encourage you to pick up Homo Ludens. Summary: an optimistic, visionary plea for harnessing the power of games to improve society and increase happiness, focusing on gamification and alternate reality games. Written for a general audience, so good for outsiders or even gamers, but of limited use for game developers. I’ll start this review with a caveat: this is not my kind of book so I approached it with some trepidation, but still wanted to give an honest, fair review of the text for people who are more into the subject matter. Thankfully, even though my reservations remain, I thought Reality is Broken was very good and brought me some new ideas and terms I was unfamiliar with. The book is just over 400 pages, though I thought it was a quick read. McGonigal’s writing style oozes with friendly, infectious optimism, almost like a full-length version of her TED talk. It’s divided into fourteen chapters, each identifying a problem (with reality) and a fix (derived from games). It is written for a general audience, so insider lingo (like “co-op”) and very popular games (like World of Warcraft) are described in great detail and might bog some readers down. On the flip side, information most people aren’t familiar with such as new terminology (like “ambient sociability”, where you play solo in a multiplayer world) and relatively obscure alternate reality games (like World Without Oil) are also detailed out. Reality is Broken has more practical information than I would expect from such an inspirational book due to the level of detail in these examples, but still lies very much in the realm of ideas rather than a how-to guide. There are a few key arguments McGonigal makes within the book and she backs each of them up with one or more case studies of existing games, both from popular entertainment and from the fringes of serious games and alternate reality games. She argues first that reality is broken – our communities have become fractured, people are not engaged in civic and social issues, depression is epidemic, and our jobs leaves us largely unfulfilled. Second, that games excel in fixing these problems by creating virtual communities, engaging people meaningfully in productive work (even if that work is toward goals in video games), making people happier and more fulfilled, and fostering collaboration. This leads to a plea to use the well-tuned systems in games (short and long-term goals, immediate feedback, multiplayer mechanics) toward real world systems (education, investigative journalism, citizen science, and so on) in order to engage people in fixing the world’s problems, using those productive hours for lasting change instead of escapist entertainment. Lastly, McGonigal claims that gamers themselves are perfectly suited to help fix those larger-than-life problems with their extensive experience in collaborative projects and crowdsourcing (such as WoWiki, or folding@home). One element throughout the book that I found particularly valuable is McGonigal’s description of the design process and thoughtfulness behind several of the alternate reality games that she has designed. (She also uses the term “directed”, which I don’t see often in game development but is surprising apt to describe the ongoing performance-oriented gameplay of alternate reality games.) The author takes many lessons from positive psychology (the study of happiness) and designs her games to include “happiness activities” like physical touch, complimenting or helping others, contemplating death, and collaborating in service of a much bigger goal. She admits that these activities, even though they are supported by research, are “hokey” and come off as inauthentic to the skeptic (incidentally, exactly what I was thinking when I reached this section) and that even though we know what to do to be happy, we still do not do it. McGonigal points out that games can be used to trick people into engaging with them and gives specific, detailed post-mortems of how she integrated these activities into her games. Mind you, the examples that demonstrate McGonigal’s claims – alternative reality games that successfully and meaningfully improve the world – are few and far between, reaching a crowd numbering in hundreds or lower thousands. While they have interesting design goals and strategies, these games are not yet changing the world on the massive scale that McGonigal envisions. She is a futurist not a historian, and her role as a researcher at the Institute for the Future means I expected a lot of big, provocative statements that have yet to prove themselves. Like I mentioned at the start, I have some reservations about Reality is Broken. There is a lot of focus on psychological studies and applying their results to games or game-playing but most of these studies are phrased as variations of, “study suggests X in Y scenario, so then it should still suggest X in Z scenario”. These are bold claims, especially when they make up the bulk of McGonigal’s argument that games can improve happiness, yet few of the studies directly deal with games. This isn’t really the fault of the author – the problem lies in how little research there is now and how much work there’s yet to be done. Since the author works on the bleeding edge of serious games, and this text is, in part, to demonstrate the worthiness of future work, I found these leaps of logic pretty reasonable if under supported by the science. As a designer, I have some other nitpicks, such as the focus on feedback to mean points, achievements, badges, and levels – these are qualities that give gamification a bad reputation. (Feedback in game development means much, much more than ticking numbers.) The author also puts an overwhelming emphasis on questing, avatar rewards, mini-bosses, and similar role-playing game structures as the “fix” to gamifying real-world systems, which I disagree with. (Note: the author never says gamify or gamification in the book to describe this process). But as a book targeted at the general audience, this is not really the place to dive into the subtleties and best practices regarding game design. I would love to see a book by McGonigal written directly for game designers on how to take those lessons from positive psychology, crowdsourcing and collaboration, and so on and apply them to games, and vice versa. 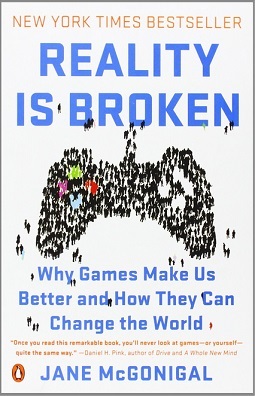 The main reason I find myself hesitant towards Reality is Broken is that I am naturally skeptical of a book that makes such big, grand, self-serving claims about how games can fix the world, repair broken communities, treat depression, and harness the ‘crowd’ to solve problems like climate change and food insecurity. As a game designer, I’ve already staked my career in games and I naturally want to hear that they can be used to improve the world. But when the claims are as overstated as those McGonigal proposes – especially when propped up by some questionable psychology – I can’t help but let my skepticism lead the way. I sincerely believe there is a place for serious games and that work in this area is valuable and meaningful. But the level of optimism strikes me as naïve and does a disservice towards other fields – like education – by implying that game designers can go in and “fix” them. This pushes my buttons the same way Silicon Valley start-ups attempt to “disrupt” various social services with their technological expertise, often causing more problems than they purport to solve. I think we need a bit more humility in our lives, and that is something Reality is Broken does not serve its readers. All that said, I did enjoy the book. It’s easier for me to talk about what I didn’t like than what I did so I don’t want to give you an unfair review. It is deliberately provocative and demands a lot of discussion, so if the goal were to increase the discourse about the positive power of games, I’d consider this a success. I’d easily recommend it to people who think of games only as escapist entertainment or otherwise don’t see the value in gaming but are naturally curious (I know two non-gaming family members who will be getting a copy next time I see them). Game developers who are interested in alternate reality games and serious games may want to give this a try, but keep in mind it’s not a text that teaches you how to design with these elements in mind, but rather why you should.